What is Bluetooth 5.0 and What Makes It So Different from the Previous Versions? Bluetooth 5.0 is finally here and everybody wants to try those new earbuds and headphones featuring the latest Bluetooth version. Bluetooth 5.0 is supposed to improve sound quality, range, connectivity, and reliability and we were anxious to find out if all the stories about the latest Bluetooth version were true. The article in front of you and our list of the best Bluetooth 5.0 earbuds and headphones are the results of our testing of more than 20 latest earbud and headphone models. We have considered this topic important and we had to give our contribution and try to present all the benefits (and issues) of the latest Bluetooth 5.0 and give you our opinion on the currently available earbud and headphone models. If somebody would ask you to list the things that characterize the modern era, what would you say? We bet that wireless/Bluetooth connectivity would be one of the things. Bluetooth was first introduced in 1999 as Bluetooth 1.0 and it’s been developed ever since in order to reach today’s level. The first devices with built-in Bluetooth entered the market in 2001 and their number significantly increased during the initial 3-year period. Later, the Bluetooth 3.0 was introduced in 2008, while the Bluetooth 4.0, 4.1 and 4.2 were introduced after 2010. Basically, after every year or two, they were introducing a new version of Bluetooth, and every version offered greater speeds, longer range, and reduced level of data compression. For some time, we were stuck with V4.2, until the newest and, so far, the best Bluetooth version appeared in 2016. This was the fresh release that showed certain improvements in terms of Bluetooth performance and made the use of Bluetooth more interesting and easier. Even its name is different and simpler because you can simply call it Bluetooth 5. For this article, we have prepared two separate lists – 5 best Bluetooth 5.0 earbuds and 5 best Bluetooth 5.0 headphones. On these two lists, you will find all the most popular models of earbuds and headphones currently available on the market. We have tried to find the best options for different users which is the main reason why you should be able to find something that suits your taste. All the models are truly great investments since they all offer great performance at a reasonable price. Bluetooth is one of the most developed and omnipresent modern technologies. Once in a few years, we get the new improved version that manages to amaze us with its performance and capabilities. The creators manage to surprise us every single time with the improvements in terms of speed, data compression reduction, wireless range, etc. However, the users always manage to expand the list of their needs and requests and the necessity for the upgraded version appears again. Bluetooth 5.0 has been introduced a few years ago as the latest version of Bluetooth communication. It hasn’t been built into all the new devices but the number of headphones and smartphones supporting this version is increased every day. This Bluetooth version has been released due to continuous user demands for IoT-based devices. As IoT development demands more powerful Bluetooth features, the developers had to find a way to satisfy the needs and requirements of their users. So far, Bluetooth 5.0 has been the best solution thanks to its enhanced features regarding connection stability, connection speed, wireless range, message capacity, etc. Bluetooth 5.0 is definitely not perfect and there are still some things that have to be improved but it truly represents a great improvement in comparison to the previous 4.2 version. The most important and the most obvious improvements are: 4x longer wireless range, 2x faster connecting and even 8x bigger broadcasting message capacity. Along with the ability to coexist and work with other technologies and other Bluetooth versions, the latest 5.0 version becomes really amazing. Faster connectivity, greater responsiveness, and better performance have made a great contribution to the use of IoT. The everyday use of Bluetooth-enabled devices and communication has become much easier and more reliable thanks to Bluetooth 5.0. We can only imagine what will happen once this technology gets upgraded again. Now that you know a few basic things about Bluetooth 5.0, let’s go through our list (or lists) of the best Bluetooth 5.0 earbuds and headphones. Each review consists of three parts – unboxing, upsides, and downsides. We have tried to list all the good and bad things about these earbuds/headphones and give you our opinion on what to expect from each Bluetooth 5.0 earbud/headphone model (in terms of connection quality, reliability, battery life, and sound quality). The first pair of earbuds on our list is the model made by the well-known manufacturer Anker, famous for its quality products and their affordable prices. The model we decided to present to you is called Soundcore Spirit X and it is one of the best representatives of the brand. The earbuds come with 10mm drivers with composite diaphragms, Bluetooth 5.0, the battery that can last up to 12 hours (at 60% volume), and a sweat-proof coating. Spirit X also supports AAC and SBC Bluetooth codecs and they are advertised as noise isolating earbuds. The earbuds come in black color only and, on the right side, you will find a small in-line control pad with the play/pause button, volume controls, built-in mic, and USB port for charging. Spirit X buds weigh 0.05 pounds and their charging time is 1.5h. The earbuds come in a very simple white and blue cardboard box that hides a small zippered hard-shell carrying case. Inside the case, you will find the earbuds with one pair of ear tips. Apart from that, you get four pairs of spare tips in different sizes and two pairs of ear tips with wings, also in different sizes. The manufacturer additionally sends one USB charging cable, one shirt, and two cable clips. Anker Soundcore Spirit X are nice-looking sport earbuds that can be used in all everyday situations. They are very light and highly portable – you can wear them around your neck or in your pocket. In case you want to keep them safe when they are not in use, you can put them in their travel case that can be attached to a bike or a backpack thanks to its carabineer or you can simply put it in the pocket. The earbuds are quite comfy. They are incredibly light and there’s a wide range of differently sized and shaped tips as well as semi-flexible ear hooks that help the buds stay in your ears during your workouts. The earbuds come with one shirt and two cable clips that enable you to shorten the cable and attach it in order to prevent it from dangling. When it comes to sound quality, we were quite impressed considering the price. 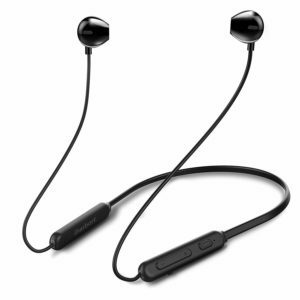 You will hardly find a better sounding pair of Bluetooth earbuds in this price range, especially considering the fact that they support the latest Bluetooth version with an excellent wireless range and stable connection. These are bass-oriented earbuds – the lows are slightly more emphasized than the rest of the audio spectrum. However, the vocals are clear and crisp and the treble is not bad at all. First of all, we would like to see the earbuds in some other colors. Also, they are a bit bulkier than the average earbuds due to the ear hooks that cannot be detached. Second of all, Spirit X aren’t the most durable earbuds on the market and you should be very careful with the cable which is, at least in our opinion, thin and kind of flimsy. The soundstage is quite poor and the highs can get quite painful at high volumes, which can ruin the overall listening impression. Finally, we have to warn you about the in-line remote. Many customers complained about its weight and position. When you adjust the cable with the clips, the remote somehow gets behind your head, making it more difficult to use. Also, due to its weight, the right earbud tends to fall out more often than the left one. 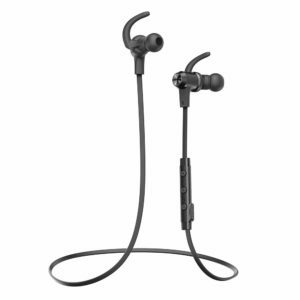 TBI Pro Bluetooth earbuds are affordable truly wireless earbuds featuring Bluetooth 5.0 technology with a standard 33ft wireless range and a built-in Qualcomm CSR 64110 chip. The earbuds come in black/red color combination. They are packed inside their carrying box that is also their charger. Once charged, the charging case can offer up to 5 charging cycles, while you get 4-5 hours of battery life per single charge. The earbuds have a built-in mic and they have touch-sensitive controls. They are completely cable-free and completely waterproof and sweat proof (IPX7 rating). The earbuds come in a small black cardboard box that contains user manual, the charging case with the earbuds, a set of two spare pairs of silicone tips in different sizes, two pairs of foam tips in different sizes, and two ear tips with ear wings for additional stability. Along with the earbuds, you get a USB charging cable that you use to charge the charging box. TBI Pro are the truly wireless earbuds with a decent number of features. The best thing is that they really don’t cost a fortune. They are nicely designed and quite small, which makes them hardly noticeable. The charging case has built-in magnets, which make it easier to set the buds correctly for the charging process and the light indicator tells you whether the charging is in progress or not. The case can also be used for transporting the buds, especially because it’s so small. The earbuds are quite comfortable thanks to their small dimensions and small weight. They will stay put in your ears longer than many other earbuds because of the variety of spare tips that improve the overall stability. Also, the earbuds have a built-in mic that enables you to answer calls. The pairing with different kinds of devices is very simple and quite fast. The first pairing takes a few seconds more but every next pairing is automatic. The earbuds deliver nice and pleasant sound with a slightly emphasized bass, clean mids, and pleasant treble. Listening to any music genre on these earbuds will be quite a pleasure for any ordinary user. TBI Pro true wireless earbuds can’t really compare (in terms of sound quality) to any of the high-profile earbuds or headphones. Also, some customers find them too quiet for their needs. The earbuds don’t have volume controls so you will have to reach for your device every time you want to turn the volume up or down. You can use the controls on the buds to play/pause the music, answer/end call or skip tracks. The only problem is that these controls are separated – some things are controlled with the left and the other things with the right earbud, which can be confusing for some users. Some customers also reported problems with the connection between the two buds. The third model on the list of 10 best Bluetooth 5.0 earbuds and headphones is iHarbourt C3 that comes in an elegant black and white box and it’s more than affordable. The earbuds weigh approximately 0.10 ounces, they have a rechargeable battery that offers up to 9 hours of playback time after only 1.5 hours of charging, their max range is 33 feet, and they have IPX5 water resistant rating. On the right side, there’s a control pad with a USB charging port, volume controls (also used for skipping tracks), Bluetooth indicator light, multifunction button (play/pause/pair), and a small built-in mic. The earbuds come in a very simple but sleek cardboard box with the user manual, 18-month warranty card, USB charging cable, and a pair of ear tips with ear wings. Let’s start with the first thing you will notice when you see them – physical appearance and design. We must confess that we really like them – the earbuds are simple yet elegant and they have all the important features that most people would need. C3 are pretty weightless. Combine that kind of lightness with a shape of the housings that lays nicely in ears without causing any fatigue, and you will get a very comfortable pair of earbuds. Most of the customers agree the earbuds are stable in ears but if you need some extra stability for certain types of workouts, you can try using the provided tips with wings that should do the job. We also must note that, unlike most of the Bluetooth earbuds, C3 have the pads/reinforcements on both sides, which adds some balance and prevents the buds from falling out. In addition, they have metal housings with magnetic ends so you can wear the earbuds around your neck when not in use, without worrying about losing them. When it comes to sound quality, you will probably be satisfied if your expectations aren’t too high. After all, these are relatively cheap earbuds. They deliver nice and pleasant bass and they sound good no matter what kind of music is played. The Bluetooth connection is stable, the pairing is fast and easy, and the battery life is long enough to cover most of your daily activities. C3 are advertised as noise-isolating earbuds but most of the customers claim they don’t do that part of the job well. Also, some users complained about the magnets not being powerful enough. In addition, you should know that the multifunction button does not enable you to resume your activity after you pause it. If you want to keep listening to a song after ending an incoming call, you will have to reach for your phone, which can sometimes be annoying. 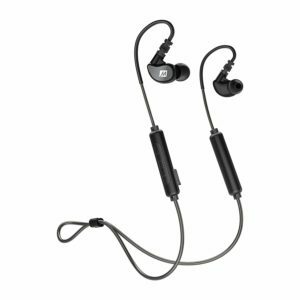 M6B are very popular and very affordable Bluetooth 5.0 in-ear headphones made by the MEE. The earbuds are designed for active people and they are available in many colors (black, clear, mint, coral, grey/black, etc.). M6B have 10mm drivers, they weigh 0.5 ounces, they are also IPX5 certified, and the frequency response spans from 20 to 20,000 Hz. They feature Bluetooth 5.0 with a 30ft wireless range. The supported profiles are A2DP, HSE, HFP, and AVRCP. Charging takes 2 hours and it will provide you with up to 9 hours of playback/talk time. The earbuds come in a simple package with one USB charging cable, 4 pairs of spare ear tips in different sizes, and user manual. A nice zippered carrying case and a cable clip are also included. M6B are nicely designed earbuds. It’s the kind of design that will be appreciated by the active people and those who need their earbuds to stay stable in ears even during the longest and hardest workouts. These earbuds have a simple but efficient design. They are light and their housings are shaped in a way that enables the user to wear them around his ear. This, along with a slightly angled ergonomic tip design makes the earbuds very comfortable and stable even if you move a lot. However, in order to achieve the perfect fit, you will have to try out all the provided tips and find the right size for your ears. MEE M6B earbuds have the pads on both sides of your head, which means you won’t feel any extra weight or disbalance while wearing them. The inline remote is on the right side and it’s quite easy to use. In case you find the cable too long, you can shorten it by using the provided clip and prevent it from dangling and bouncing. In order to keep your earbuds safe during transport, you can use the zippered carrying bag, which is so small that it won’t add any additional weight to your bag. We have to be honest with you – the sound quality is not perfect. We can’t say that they sound bad but we would like more bass and wider soundstage. However, if your expectations are reasonable, you may even like them. These are not bass-heavy earbuds like many others on the market. The bass is there but it’s kind of tiny. Considering the price, you can’t really expect the earbuds to last forever and stay in the same condition they were the day you bought them. For this reason, using the carrying case is a must because the cable is prone to tangling, which subsequently leads to its breaking and damaging (especially at joint). TT-BH070 is one of many TaoTronics models that have been highly praised by the customers. They weigh 0.6 ounces, they come only in black color, and have inline remote that enables you to play/pause the music, pair the earbuds to your device, adjust volume or skip tracks, answer calls, and charge the earbuds. The charging process takes 2 hours and the battery can last up to 9 hours. The earbuds feature Bluetooth 5.0. They support APTX audio codec, as well as A2DP/AVRCP/HSP/HFP profiles. The earbuds are also IPX6 certified. TT-BH070 earbuds come in a simple cardboard box with their user manual, soft carrying pouch, short USB charging cable, two spare pairs of silicone tips, two spare pairs of ear hooks, and one shirt clip. TT-BH070 are reasonably-priced Bluetooth in-ear headphones that look attractive. They are great for workouts but also for all kinds of everyday activities (working in an office, walking, commuting, etc.). They have a nice ergonomic design that enables secure fit, especially because of the provided ear wings. The important thing is to find the right size that fits best your ears and the earbuds should stay in your ears no matter what you do. We really like that fact that they are light and easy to transport in a pocket, even if you use the included carrying bag. In case you prefer to have them around your neck, you can wear them like a necklace because of the magnetic housings. They also have a built-in mic, which makes it easier to stay in touch with other people no matter where you are. We also like the flat cable – it’s less prone to tangling and it seems relatively durable. In addition, the earbuds have IPX6 rating, which makes them even more durable – they won’t be damaged by sweat, rain or even splashes of water. As far as the sound quality is concerned, these earbuds sound decent for the price. We must admit they can’t compete with some high-end headphones but they do an excellent job for the price. The bass is present and enjoyable, while the mids and highs are balanced and pleasant for listening. Also, the tips provide a pretty good seal – the earbuds manage to isolate a great part of the ambient noise. The battery life is long enough – you can work out several times a week before you need to recharge them again. BH070 earbuds come with 3 pairs of S, M, and L ear tips but it seems that this is not enough for some people, especially for people with really small ears. Including an extra pair of ear tips in XS size would be a smart move. Here’s the second part of our list of the best Bluetooth 5.0 earbuds and headphones where we are going to focus on the over-ear headphones. 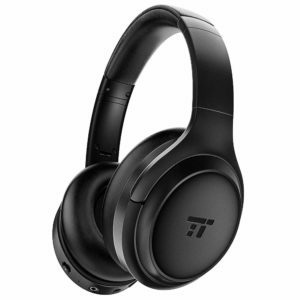 TT-BH060 are full-size over-ear headphones that come in matte black color and weigh 7.7 ounces. These ANC headphones use Bluetooth 5.0 and they can be used as both wired or wireless. On the right cup, you will find power on/off button, ANC switch, Bluetooth indicator light, mic, audio cable port, and volume controls. On the left side, you will find a USB charging port. TT-BH060 come in a nice and simple silver box with TaoTronics logo on the front side. Inside the box, you will find a relatively small zippered carrying case. All the items are packed inside the case. There are the headphones, user manual, detachable audio cable, and one short USB charging cable. Although the design of TT-BH060 is quite simple, we really like it. They are big and comfortable but not too bulky or too heavy. They have thick and soft cushions and a nicely-padded adjustable headband. The controls are easy to use and the pairing process is quite simple and fast thanks to the latest Bluetooth version. This also contributes to latency reduction. The headphones can be used as wireless or wired. Their long-lasting battery will amaze you – they can deliver up to 30 hours without ANC. If the ANC is enabled, the number reduces to 24 hours which is also pretty impressive. In case you want to save battery or you run out of juice, you can simply plug in the detachable cable and keep listening to your favorite music. They are also foldable and the earcups can swivel, which makes their adjustment and transport much easier. TT-BH060 aren’t the most expensive headphones on the market but they do sound very nice and pleasant for the price. They have slightly emphasized bass, warm mids, and clear but slightly brighter highs. Apart from that, ANC technology really manages to cut out most of the ambient noise so you can enjoy your music without interruptions. We are aware of the fact that these are affordable headphones and that we can’t expect too much of them but we should point out that they are completely made of plastic. Some customers reported problems with the plastic joints snapping after a short period of time, so we recommend you to be careful with the headphones and transport them only in their carrying case. Sadly, we also have to complain about the sound. Although ANC helps you run away from the outside world and from the noise, it significantly changes the way your music sounds. ANC basically cuts off the bass and a part of the low midrange. Some people say that the headphones actually sound better with the ANC turned on – we guess it all depends on your music taste. Paww WaveSound 3 are Bluetooth over-ear ANC headphones that come in black, blue, and white colors with many interesting and useful features at a very reasonable price. The headphones have 40mm drivers and they weigh approximately 12.8 ounces. They support APTX low latency and their battery can last up to 16 hours with ANC off while charging takes approximately 4 hours. On the right cup, you will find track and volume controls, Bluetooth multifunction button, mic, Bluetooth indicator light, and aux jack. On the left cup, you will find a USB charging port, ANC switch, and ANC indicator light. 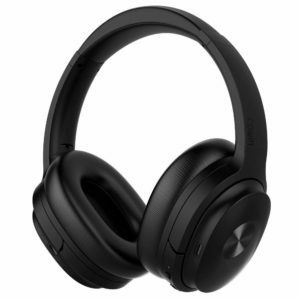 The headphones come in a nice branded cardboard box along with a sturdy zippered carrying case, detachable 3.5mm audio cable, short USB charging cable, user manual, 1-year warranty card, and one airline adapter. 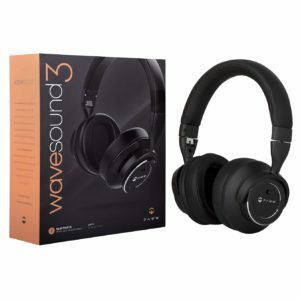 WaveSound 3 are large and comfortable headphones that have an interesting design and come in three colors. Their controls are easy to use and they can be both wireless or wired depending on your needs. The battery life is quite decent but the fact that you can simply plug the cable in, makes you feel more comfortable and confident about their use. These headphones offer many useful features – there’s a built-in mic, wired/wireless mode, and the ANC feature that can be turned on or off depending on the situation. The pairing is easy and fast, especially if you’re pairing the headphones with some of the latest smartphone models that support Bluetooth 5.0 themselves. 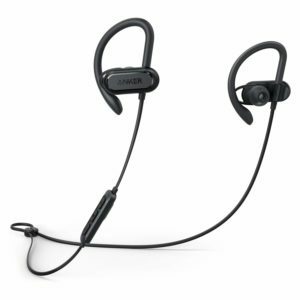 Paww WaveSound 3 seem quite durable and reliable due to their metal headband. The headband and the cups are nicely and thickly padded, which makes the headphones very comfortable. Also, we can’t complain about the sound quality, especially considering the price. The bass is punchy and present, while the mids/vocals and the highs are very clear and pleasant for listening. The important thing is that the overall sound quality is not affected by the ANC feature (the difference in sound signatures when the ANC is enabled or disabled is barely noticeable). The headphones aren’t made for people who like bass-heavy sound. You won’t hear that kind of bass if you decide to buy WaveSound 3. The bass is audible but not too emphasized. Although the battery life is great, we must note that it is significantly shorter than the battery life of some cheaper ANC headphones. Also, this model of Paww headphones is heavier than some other headphones and it can look a bit bulky on the user’s head. Cowin SE7 are Bluetooth 5.0 headphones that support ANC and Apt-X low latency technology. They are not too expensive and you can choose between black, purple, dark green, red and gold colors. The headphones weigh 0.6 pounds and they can be used as wired or wireless. It is advertised that the battery can last up to 30 hours. The recharge takes up to 3 hours. Also, the manufacturer claims that 10min of charge can get you 1 whole hour of playtime. On the right cup, you will see al the controls and ports. There are ANC switch, volume controls, multifunctional button, aux port, USB charging port, and ANC and BT indicator lights. The headphones come in an elegant branded black box with 4.2ft detachable cable, USB charging cable, strong carrying case, airplane adapter, 6.3mm headphone adapter, and user manual. A small pouch that you can use to store the adapters and cables is also provided. SE7 are smaller and more discrete than the other Cowin models. They are light, nicely padded and cushioned, and the headband’s length is adjustable, which makes the headphones very comfortable and pleasant for long sessions. The Bluetooth 5.0 enables you to pair them with your device quickly and easily and the connection remains stable within the 47ft range. Although the headphones are made from plastic, they seem stable, strong and durable because they don’t have that familiar flimsy feel than many plastic headphones have. They are foldable, and the cups can swivel and rotate, which makes them easy to transport. Also, they can be used as wired (3.5mm or 6.3mm jacks) or wireless (Bluetooth 5.0). ANC feature can be turned on or off depending on your needs. Having in mind that these aren’t audiophile headphones, we have to say they sound very good. They produce powerful bass which makes them suitable for listening to bass-heavy music. ANC feature works nicely and the headphones don’t leak too much sound. The mic is useful and it enables you to make/receive important calls but it is not made for recording. The headphone cups/cushions can be a bit tight and small for people with bigger ears. Be careful with the ANC – this feature needs a battery in order to work (even if you use headphones in wired mode). SE7 headphones have a great battery but the problem is that the advertised 30 hours is much longer than the achieved 15 hours. Of course, 15h playtime was achieved with the ANC on. If you disable the ANC feature, you will get a few hours more but still less than 30 hours. The sound could be better – the bass tends to get boomy at high volumes and it overpowers the mids. Turning the ANC on will reduce the bass and bring more balance to your music. 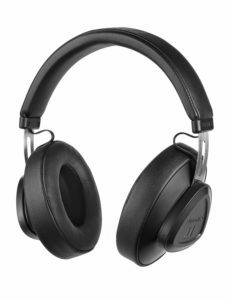 Bluedio TM are also Bluetooth 5.0 headphones. They come in yellow, black and red colors. They can only be used in Bluetooth mode (no wired mode) and they have a very reasonable price considering the features they have. These headphones weigh 7.7 ounces, they have 47mm drivers and the battery can deliver up to 30 hours after being fully charged. The recharge process takes 2 hours. 10-minute charging ensures full 2.5 hours of playback time. The manufacturer has also provided Bluedio app that enables you to use Alexa or Baidu, check the forecast, listen to music, etc. On the right cup, you will see the charging port, volume controls, Bluetooth indicator light, and power on/off button. The headphones come in a nice black cardboard box along with the user manual and a USB-C charging cable. Bluedio TM are great affordable headphones. They have an interesting design, and they are available in many attractive colors. The headphones are very light and the cups are nicely cushioned, which means the headphones shall be quite comfortable for most of the users. Thanks to a slightly tighter fit, they remain absolutely stable on your head no matter how much you move. Also, the headband is easily adjustable. In spite of their price and our expectations, these headphones sound great. They have enough bass, the mids and the highs are there, and if you don’t like the current sound signature, you can press the volume controls together for a few seconds and change it. This double press activates EQ presets, which allows you to choose between three sound signatures. Apart from this, the headphones are quite loud. Although some other headphones in this price range are equipped with detachable audio cable, ANC or NFC technologies, you won’t get any of these features if you buy Bluedio TM. The manufacturer wanted these headphones to be used as simple Bluetooth headphones but in case you want to make them wired, try buying a USB-C to 3.5mm audio cable and you should be able to use them in wired mode. The headphones are light and adjustable but they can still be a bit tight and the cups can be too small for people with larger ears and larger heads. In addition, the headband could have been thicker and softer. Also, the headphones can’t be folded and the cups don’t swivel. The manufacturer doesn’t provide a carrying case, which also makes them more difficult to transport. The last pair on our list of the best Bluetooth 5.0 earbuds and headphones are Mkay 816. These are quite affordable headphones with many interesting features. They come in rose-gold color and they are mostly made for young people, even children. There’s a black model, too but it is slightly different in terms of design and features. MKay 816 are full-size headphones that can be used as both wireless and wired. They have a 30ft range and their battery can last up to 14 hours while recharge takes 2.5 hours. On the right cup, you will see the multifunction button, volume controls, the button that enables you to switch between BT, MP3 and FM modes, power on/off button, micro SD card slot, USB charging port, aux port, mic, and the Bluetooth indicator light. The headphones come with a nice zippered hard-shell case, user manual, charging cable, and a detachable audio cable. 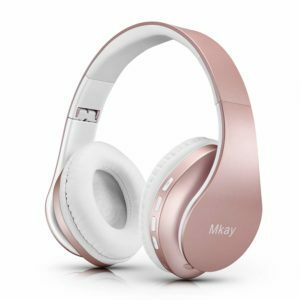 MKay headphones are amazing headphones with an amazing price. They look very attractive and elegant. 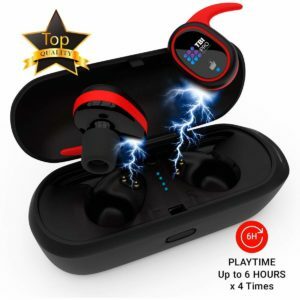 They support the latest version of Bluetooth that ensures easy and fast pairing and more stable connection. They can also be used as both wireless and wired, which is great in case you run out of battery. One of the greatest things about these headphones is that you can use them with any of your devices, no matter if they are Bluetooth-enabled or not, but you can also play the music directly from your SD card (up to 32GB) or simply switch to built-in FM radio. The headphones have an adjustable headband and foldable cups, they are very light and don’t cause any pain in your ears or head. The cups are nicely padded and the shape of the cushions follows the shape of human ears for a better fit. The sound quality is more than satisfying considering the price and the volume of these headphones is surprisingly high, which is great if you’re working out in a crowded gym or riding on a crowded bus. First of all, it would be nice if there were more color choices. Something more neutral (black or white) would be a nice improvement. Second of all, we want to warn you about the mic – you can’t use it when the headphones are in wired mode. Additionally, these headphones are advertised as children headphones but they are quite large and can look a bit bulky on a child’s head. Also, the padding on the headband could be thicker and better filled. It seems that the current one doesn’t have enough stuffing and it feels a bit empty. The headphones are completely made of plastic and seem quite fragile so we would recommend you to use them carefully and transport them only in their carrying case. Last of all, the headphones don’t have ANC and they leak a great amount of sound, especially at high volumes. Bluetooth Low Energy was designed at the same time as Bluetooth 4.0 and they were introduced at the same time. In fact, it was planned to enable Bluetooth Low Energy to work with 4.0 version. Unfortunately, technology has encountered many problems and they haven’t been completely solved until the Bluetooth 5.0 was introduced. The basic purpose of this technology is to reduce the amount of energy that Bluetooth devices use in order to transfer files/data. Subsequently, this enables extended battery life and longer playtime as Bluetooth devices have rechargeable batteries with limited longevity. The developers have managed to solve all the issues and enabled us to use two or more Bluetooth 5.0 devices that communicate with each other while using the minimum power. Dual audio is a very interesting and useful feature that allows the users to play audio content on two different devices simultaneously. For example, you can take one phone and pair it to two different Bluetooth speakers and play the same music at the same time. Great for parties, isn’t it? Also, you can connect your phone to two different pairs of Bluetooth 5.0 headphones and listen to the same music with your friend or family member without the annoying necessity to share one pair of headphones or earbuds. In fact, there is also the possibility to stream two different contents to two different devices from the same source device. This way, you and your friend don’t have to bother each other with content that annoys the other party. The feature is pretty simple to activate. You can enable it by turning on the Dual Audio feature on your phone. This will do all the work. However, the only smartphone manufacturer that’s been using it is Samsung and you can find it only on the latest devices (starting from Samsung Galaxy S8). Hopefully, we will see many other phones and tablets with this feature in the future. When Bluetooth 5.0 was introduced, the manufacturers announced that it enables 2x faster data transfer, four times longer wireless range, and eight times larger message broadcasting capacity (compared to the V4.2). For example, Bluetooth 5.0 delivers up to 2 Mbps data transfer speeds, which is actually 2x faster than the previous version. This significantly improves the overall connection quality and enables the users to use this technology freely. It also reduces the risk of connection interruption or any kind of interference. Also, Bluetooth 5.0 devices are much better than the older devices (those with older Bluetooth versions) when it comes to video content, especially when watching videos on your smartphone. This means that the latency is reduced to the minimum. Bluetooth 5.0 delivers a much longer wireless range than any of the previous Bluetooth versions. It may never go to the advertised 800 feet but, based on our experience, we can confirm that the range is much longer. Remember just one rule – you have to use two Bluetooth 5.0 devices in order to achieve the maximum possible range. The interesting fact is that these devices can actually choose whether they want to go for the speed or for the range. Focusing on faster data transfer is more useful when two devices are close to each other. On the other hand, focusing on providing a stable connection at a larger distance is more useful when the devices have to exchange a small amount of data and when the transfer speed is not the main concern. If you consider the fact that these devices do all this by using Bluetooth Low Energy protocol, you will realize how much battery life this new Bluetooth version saves. Being backward compatible means that Bluetooth 5.0 devices aren’t limited to communicate to other 5.0 devices and we have mentioned this in the text above. They are completely capable of communicating with all the devices that support any Bluetooth version and enable you to listen to music, podcasts, answer calls, etc. 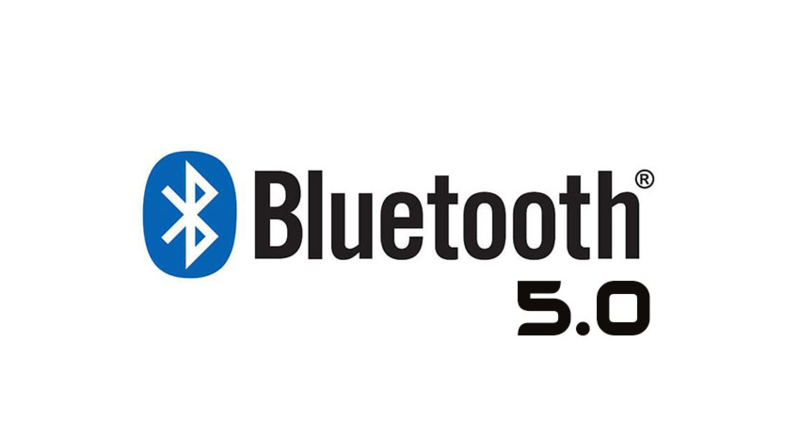 Bluetooth 5.0 devices are able to connect to all kinds of smartphones, speakers, players, etc. It may seem odd but there is only one disadvantage of the latest Bluetooth upgrade and it’s not an actual disadvantage (it’s not directly related to the Bluetooth 5.0). Despite the fact that your Bluetooth 5.0 device will work normally when paired with some other Bluetooth-enabled device, you won’t be able to completely enjoy all the previously mentioned advantages of Bluetooth 5.0. The number of available features/advantages is limited by the older Bluetooth version. In other words, when used in combination with an older Bluetooth-enabled device, you won’t get the max speeds, range, or the kind of reliability and connection quality you would get when two Bluetooth 5.0 devices are paired together. Currently, there are a few smartphone models featuring the latest Bluetooth version (iPhone X, iPhone 8, iPhone 8 Plus, Samsung Galaxy S8 and other newer models) but the number of older Bluetooth-enabled devices is still much larger. The situation will certainly get better in the years to come and, at some point, we will all be able to enjoy the benefits of Bluetooth 5.0 without any limitations. In the end, we sincerely hope that our list of 10 best Bluetooth 5.0 earbuds and headphones was useful to you and that it helped you learn some new facts about these great devices and this great new technology. If you have any questions about certain earbud/headphone model or if you want to share your experience, feel free to comment. NextWhat is True Wireless Stereo Technology (TWS)?